I'm more worn out now than I was when I left New York - some vacation! Today we walked about 36 miles and climbed a few mountains of stairs. Luckily we were able to load up on calories (nutella/banana crepes, to start) so we didn't get fatigued from hunger. 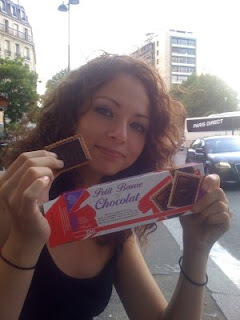 Only when I missed the step for the bus and busted it bigtime (effectively twisting my ankle and embarrassing myself in front of French people while Rae laughed) did I give in to my aching extremities who'd been begging for a respite. Today we visited four stunning cathedrals - St. Sulpice, Notre Dame, St. Severin and St. Germain. 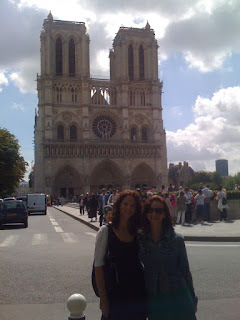 Now that I'm looking at the pictures, I can't quite recall which is which, other than Notre Dame. Loved the architecture, the glorious stained glass window, the bell towers & the organ music. 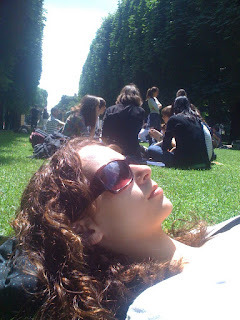 I must be a special kind of dolt for having only visited Notre Dame before... what in the world was I doing when I lived here in 2003? (Note: reading Gone with the Wind.) 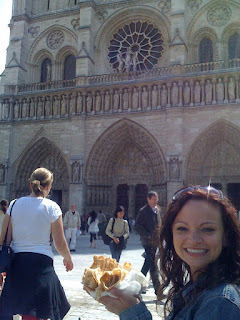 Outside Notre Dame, we were told by some skeezy guy that we looked much more Russian than American. Apparently, our cheekbones tell a Russian tale... and since RaeRae made the mistake of responding to the man's comments, I made sure she had to deal with him. 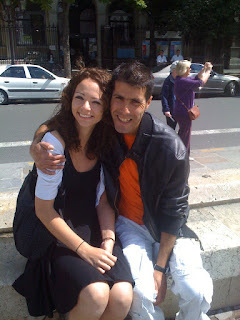 Post-sketchy interaction, we tooled around the Ile de la Cite looking for crepes, checked out the Conciergerie where Marie Antoinette and the royals were imprisoned during the Revolution and napped soundly in the Jardin de Luxembourg surrounded by boisterous, skinny-jean clad French teenagers. 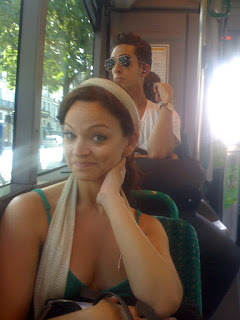 We visited Rue Daguerre, where I lived in 2003... but I couldn't remember which apartment I lived in. 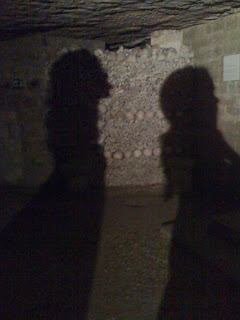 Then we descended into the Catacombs beneath the city... and were properly freaked out. Have you ever been on Pirates of the Caribbean at The Magic Kingdom? (Forgive the comparison. Goes to show my true Floridian colors.) The Catacombs are cold, damp and dark like the Pirates ride, and there are shadowy hidden corners closed off by rusty old gates. The difference: there are stacks upon stacks of ancient bones and real skulls staring back at you - and no one sings a jolly drinking song at the end. 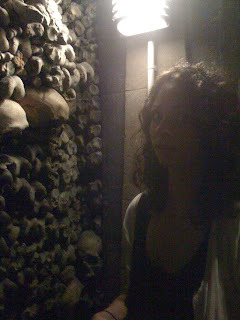 Rae and I made a pact before descending deep under the streets not to scare each other, as being surrounded by 1 million bodies worth of centuries-old skeletons is frightening enough. Shopped for snacks at the grocery store and found the BEST cookies. Will bring some back!